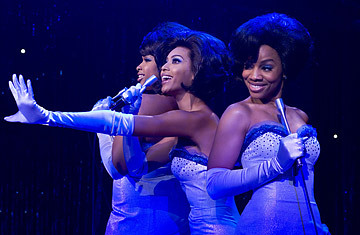 Jennifer Hudson (left) and Beyonce Knowles in a scene from the film "Dreamgirls". The 20,000-plus soldiers who defended the island against the ferocious American assault were ordered to die rather than surrender, and most did. It's a tragic epic that director Clint Eastwood personifies by focusing mainly on two stories: the dutiful, civilized general (Ken Watanabe) and a common soldier (Kazunari Ninomiya) who is clumsily, almost comically, determined to live. The dialogue is in Japanese, but this account of war madness --intense and compassionate--carries a universal and heart-breaking message.